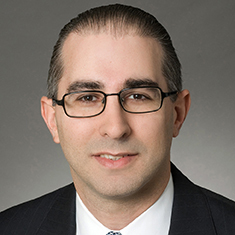 Scott M. Vetri serves as co-head of the New York Real Estate practice and is a member of the firm's Billing Committee. He concentrates his practice in commercial real estate law. He represents lenders, owners, operators and managers of office, hotel, multi-family and industrial real estate. Scott counsels institutional and closely held clients in sophisticated commercial real estate transactions, including financings, acquisitions and dispositions of assets and equity interests, joint ventures, fund formations, leasing and development. Prior to joining the firm, Scott served as Chief Legal Officer of Ark Investment Partners LP/Ark Real Estate Partners LP/Willow Advisors LLC, an international, institutionally capitalized real estate fund and property management company with a portfolio of real estate investments consisting of hotels, apartment buildings, office buildings, warehouses, mortgage and mezzanine loans, joint venture investments and development projects. He previously practiced for 12 years in large law firms. Representation of a real estate fund in the acquisition and subsequent sale of a 232-room boutique hotel located in Quebec City, Quebec, Canada. Representation of a real estate fund in the acquisition and financing of a 1,144,000-square-foot mixed-use complex located in Minneapolis, Minnesota. Representation of a real estate fund in the acquisition and financing of a 1,600,000-square-foot mixed-use complex located in Minneapolis, Minnesota. Representation of a real estate fund in the acquisition, financing and subsequent sale of a 463,000-square-foot office building located in Boston, Massachusetts. Representation of a real estate fund in the sale of a 228,000-square-foot office building located in Boston, Massachusetts. Representation of a real estate fund in the sale of a 630,000-square-foot office building located in Atlanta, Georgia. Representation of a real estate fund in the acquisition, financing and subsequent sale of a 1,400,000-square-foot office building located in Chicago, Illinois. Representation of a real estate fund in the acquisition, financing and subsequent sale of a 250,000-square-foot office building located in Washington, DC. Representation of a real estate fund in the acquisition, financing and subsequent sale of a 253,000-square-foot office building located in Washington, DC. Representation of a real estate fund in the sale of a 23-story office building located in Ft. Lauderdale, Florida. Representation of a real estate fund in the sale of a 651,000-square-foot office building located in New York, New York. Representation of a real estate fund in the acquisition, joint venture and leasing of a mixed-use property located in Chicago, Illinois. Representation of a life insurance company in the sale of a suburban office complex located in Westport, Connecticut. Representation of an international investor in the $2.2 billion acquisition of an office and retail complex located in New York, New York. Representation of an international investor in the joint venture acquisition of a 1,900,000-square-foot office building located in New York, New York. Representation of an international investor in the joint venture acquisition of a 420,000-square-foot office building located in New York, New York. Representation of a real estate fund in the sale of a 4-star luxury, franchised hotel located in New York, New York. Representation of a real estate fund in the sale of a 383,000-square-foot warehouse located in York, Pennsylvania. Representation of a real estate fund in the acquisition of a 231-room franchised hotel located in Washington, DC. Representation of a real estate fund in the acquisition of two apartment buildings located in New York, New York. Representation of a real estate fund in the termination of ground lease and sale of property formerly operated as a franchised hotel located in New York, New York. Representation of a real estate fund in the acquisition of the ground lessor's interest relating to property operated as a franchised hotel located in New York, New York. Representation of a real estate fund in the acquisition of a 65,000-square-foot warehouse located in Harlem, New York. Representation of a real estate fund in the ground lease acquisition of a 177-room boutique hotel located in New York, New York. Representation of a real estate fund in the ground lease acquisition of a 126-room boutique hotel located in New York, New York. Representation of a real estate fund in the ground lease acquisition of a 52-room boutique hotel located in New York, New York. Representation of a real estate fund in the acquisition of nine office buildings comprising 1,250,000 square feet located in Fairfax, Virginia. Representation of a real estate fund in the acquisition of a joint venture interest in a 2,300,000-square-foot office building and a 250-stall parking garage located in New York, New York. Representation of a real estate fund in the acquisition of a 42,600-square-foot retail condominium unit located in New York, New York. Representation of a real estate fund in the acquisition and subsequent sale of a 910,000-square-foot office building, owned through a ground lease, located in New York City. Representation of a real estate fund in the acquisition of a 450,000-square-foot commercial office building located in Sacramento, California. Representation of a lender in connection with the making of a mezzanine loan and joint venture investment relating to a 65,000-square-foot warehouse located in Harlem, New York, and the subsequent acquisition of such warehouse. Representation of a real estate fund in connection with a mortgage loan relating to an office building located on K Street in Washington, DC. Representation of a European real estate bank in the making of an acquisition and construction loan secured by property located in Nassau County, New York, including industrial development authority benefits. Representation of an institutional lender in a mortgage loan secured by a shopping mall located in Pennsylvania. Representation of a lender in connection with the making of a mezzanine loan relating to an ultra-luxury shopping center located in Honolulu, Hawaii. Representation of a lender in connection with the making of a mortgage loan secured by a development site located in Midtown, New York City, contemplating a luxury residential development. Representation of a lender in connection with a foreclosure and loan sale involving a mortgage loan secured by a residential development located in New York, New York. Representation of an institutional lender in the making of an acquisition and construction loan relating to a resort in Hawaii. Representation of an institutional lender in connection with several loan work-outs relating to several properties located in Chicago, Illinois and California. Representation of international banking and financial services institution in leasing of 375,000 square feet of office space and retail space in a to-be-renovated office building located in New York, New York. Representation of international banking and financial services institution in leasing of 130,000 square feet of office space in an office building located in New York, New York. Representation of international banking and financial services institution in leasing of 175,000 square feet of office space in an office building located in New York, New York. Representation of international banking and financial services institution in leasing of 230,000 square feet of office space and retail space in a to-be-constructed office building in Houston, Texas. Representation of international banking and financial services institution in leasing of 60,000 square feet of office space and retail space in a to-be-constructed office building in Austin, Texas. Representation of private equity fund in headquarters lease of 7,500 square feet of office space in New York, New York. Representation of a financial services firm in headquarters lease of office space in New York, New York. Representation of an international law firm in subleasing of 60,000 square feet of office space in New York, New York. Representation of a real estate fund (landlord) in leasing 60,000 square feet of office space in a redevelopment project located in Chicago, Illinois. Representation of an insurance company (tenant) in leasing office space located in New York, New York. Representation of an international school (tenant) in leasing two large properties in lower Manhattan to be operated as a private school (K–12). Representation of a real estate fund (tenant) in the creation and acquisition of a ground lease interest in property located at 120 West 57th Street, New York, New York, in anticipation of development of such property. Representation of a real estate fund (landlord) in leasing 125,000 square feet of space in a warehouse located in York, Pennsylvania. Representation of a real estate fund (landlord) in leasing 147,000 square feet of space in a warehouse located in York, Pennsylvania. Representation of a real estate fund (licensor) in licensing 70,000 square feet of space in a warehouse located in York, Pennsylvania. Representation of a landlord in leasing to an international law firm 400,000 square feet of space in an office building located in New York, New York. Representation of a life insurance company (landlord) in leasing 50,000 square feet of space in an office building located in New York, New York. Representation of an international real estate lender (tenant) in leasing 30,000 square feet of space in an office building located in New York, New York. Representation of an international real estate investor (landlord) in leasing 100,000 square feet of space in an office building located in Houston, Texas. Representation of an international real estate investor (landlord) in leasing 200,000 square feet of space in an office building located in Houston, Texas. Representation of a landlord in the leasing of 452,000 square feet of space, constituting the entire property, located on Park Avenue South, New York, New York. Representation of a landlord in leasing an entire 294,000-square-foot office building located in New York, New York. Representation of a hotel owner in connection with three hotel management agreements with a third-party hotel manager relating to hotels located in New York, New York. Representation of a fund sponsor in connection with the creation of a real estate fund with $180 million in capital commitments made primarily by institutional investors structured to accommodate REIT and non-REIT investments and domestic and foreign taxable and tax-exempt investors. Author, Negotiating a Commercial Lease, Business Outreach Center Network, Inc.